Sydney Andrews from Marblehead finished third in the giant slalom and 14th in the slalom at the state Alpine ski championships. Holdman was the MIAA nordic state champion this winter, finishing the course at Prospect Mountain in 20:57. He finished second in the Mass Bay West regular-season standings. A two time league all-star, he is an L-S Scholar and also runs cross-country. The 2011 state champion was unable to defend his title this season because he was competing on the national stage, where he finished second in the 10K and won the Sprint at the Junior Nationals. He won the Mass Bay West regular-season title. O’Grady, a repeat All-Scholastic, finished the regular season as Mass Bay League East nordic ski champion for the second straight year and finished fourth at the MIAA state nordic ski championships. He is also a two-time TVL All-Star in cross-country. Wight showed consistent improvement in his career, culiminating in a second-place finish at the MIAA meet in 21:00 after finishing sixth and ninth the previous two years. He helped lead C-C to a second-place team finish. An honor student, he also plays soccer. Earle piloted his squad to the MIAA nordic skiing state championship after finishing second in the Mass Bay West League during the regular season. He is a graduate of the New England Conservatory, and also coaches boys’ golf and girls’ jv tennis at C-C.
Mass. Bay West — Concord-Carlisle: Max LaChance, Calvin Wight. Lincoln-Sudbury: Ryan Clemens, Eli Hoenig, Gregory Holdman, Jordan Richmond. Cannon was the No. 3 ranked skier in the Mass Bay Ski League East regular season, then won the MIAA state meet, finishing in 26:20. An honor student, the junior netted a perfect score in the National Latin exam, and she also runs track and cross-country. Another local skier who has garnered national accolades, Meyerson earned herself a 10th place finish at junior nationals in the 5K after finishing second at the MIAA event, and third at the Eastern High School Championships. A high honor student, she will attend Williams. Schiantarelli captured second place in the MIAA state meet, finishing in 26:50. In the regular season, she tied for the top spot in Mass Bay Ski League East. She has finished in the top 10 all three years of her career. She also runs cross-country and outdoor track for the Tigers. Only a sophomore, Smith has already established herself as one of the top nordic skiers in New England. She finished tied for first in the Mass Bay Ski League East regular season. Smith qualified for the New England Junior National team that competed in Utah last month. One of the top nordic skiers in the country, Stock won three events at the Junior Nationals, which qualified her for the World Juniors in Turkey, where she was 41st in the U-20s race. She also took first at the Eastern championships. She will attend Dartmouth. Li led Wayland to a second-place finish at the MIAA state meet with three of his girls placing in the top 20 following a third-place league finish. A graduate of Nashoba and Rochester Institute of Technology, he competes in biathalons and triathalons. Mass. Bay West — Concord-Carlisle: Olivia Meyerson, Meg Yoder. Lincoln-Sudbury: Clara Cousins, Blake McCartney, Corey Stock. Nashoba: Abigail Hurd. Wayland: Hannah Brigham. Merryweather took home a host of honors this winter in earning his second skier of the year nod. He captured the state title in the giant slalom, while also finishing second in the slalom. He was the Mass Bay East individual champion for the third time. 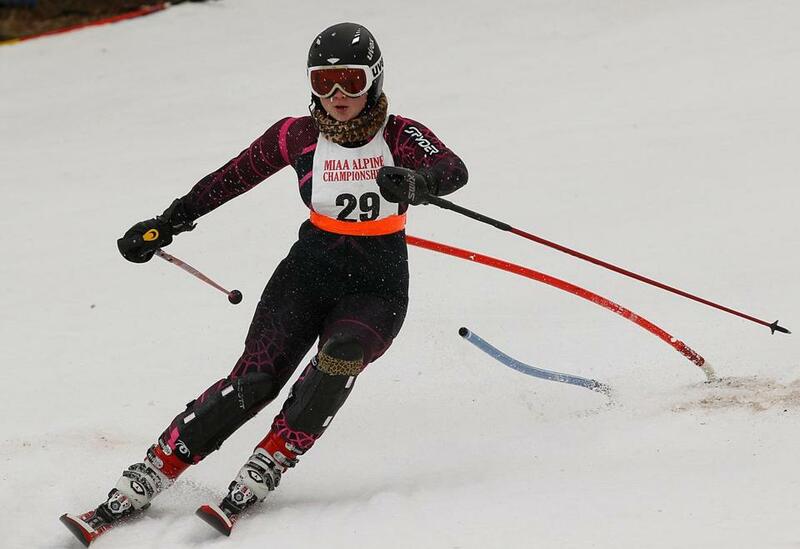 Johnson earned a sixth-place finish in the giant slalom racing at the state meet in 45.75 and followed that up with a seventh-place finish in the slalom with a 34.99. His efforts this season earned him a Mass Bay West All-Star nod in the Alpha Division. McKenna was the top overal nordic and alpine combined skier in the Mass. Bay East League for the second straight year. He finished fifth in the giant slalom in both the MIAA and Eastern Regional championship. He’s also senior class president and a talented golfer. McLeod finished third in the slalom and 17th in the GS at the MIAA state meet. He also finished as the No. 3 ranked skier in the Mass. Bay Alpha Division. He is a high-honor student, and a two-time Merrimack Valley Conference All-Star in soccer. Spencer was a key cog for the Warriors this season, capturing second place in the MIAA meet in the giant slalom and sixth place in the slalom. His efforts helped lead Lincoln-Sudbury to the MIAA state alpine championship. He also plays lacrosse. Teaming up with co-coach Matt Wentworth, Callen helped lead Lincoln-Sudbury to the Mass Bay West and MIAA state alpine titles in just his second year. A 1989 graduate of St. Lawrence University, he was a member of the ski team there. In just his second year as co-coach with Andrew Callen, Wentworth helped lead L-S to the Mass. Bay West title and the MIAA state alpine title. A graduate of North Andover and Union College, he played soccer and track in college. Mass. Bay West — Concord-Carlisle: Derrick Amodei, James Bloomfield, Alex Nardone, Andrew Solomon. Lincoln-Sudbury: Austin Barta, Will Carlough, Reed Spencer, Bradley Stevenson. Lunenburg: John Lahti. Wayland: Tyler Peyton, Jacob Rudelson. Weston: Steve Iodice. Winchester: Clay Soper. NEPSAC — Acton-Boxborough: AJ Higgins. Belmont Hill: Sabri Eyuboglu, Dan Remondi, Mike Remondi. Bromfield: Erik Johnson. Chelmsford: Connor Hart, Stephen McLeod. Lawrence Academy: Barrett Kelly. Manchester Essex: Brian McAuliff. Middlesex: Spencer Bienvenue, Brendon Canavan, Nick Kafker. Milton Academy: Jonnie Lawson. Newton South: Susie Landon, Josh Sapers, Jonah Seifer. Nobles: Alex Katz. Wellesley: Chris McKenna. Westford: Brad Cassidy, Tom Fahey, Sean Skahen, Thomas Yorke. North Shore — Andover: Adam Risman, Tom Suglia. North Andover: Nate Miceli. St. John’s Prep: Ryan Carlucci, Joe Cavalaro, Wes Groom, Bobby Holmes, Patrick McDermott, Cael Schwartz. Brown was one of the top skiers in Massachusetts all season. She finished second in the giant slalom and third in the slalom. A repeat All-Scholastic, she won the Mass Bay Ski League East division for the third time. She also plays lacrosse. Andrews finished third in the giant slalom and 14th in the slalom at the MIAA alpine state championships. She also finished fourth in the Mass Bay League regular season, while helping her team to the overall league title. Then junior also plays field hockey. Bateman, a sophomore at Leominster, captured the MIAA state title in the slalom, cruising to a finish in 36.92. She also finished third in the giant slalom helping to lead the Lunenberg-Leominster co-op team to a fifth-place finish as a team, and a Mass Bay West league championship. Carbonaro was a consistent performer in the Mass Bay East League, finishing third in regular-season standings and helping Wellesley to a second-place team finish. She finished sixth at states in both the slalom and giant slalom. An honor roll student she also plays softball. Peabody won the giant slalom at the MIAA state meet, winning a close race in 48.63. She finished the regular-season as the third-ranked skier in the Omega Division of Mass Bay West. A two-year varsity skier, she also runs cross-country for the Chieftains. A ski coach for 14 years, Ruhmann led Westford Academy to an undefeated season, the Mass Bay West regular-season title, and the MIAA state team alpine championship. He is a graduate of Chelmsford and UMass-Lowell where he was on the football, track, and ski teams. Mass. Bay West — Lincoln-Sudbury: Hayley Herzog, Sandra Nygren, Geneva Poch, Jess Singer, Alicia Smith. Lunenburg: Rachel Bateman, Casey Buckley, Hannah Buckley. Nashoba: Jenna Peabody, Rachel Peabody. Wayland: Eli Bucher, Alice D’Orlando. Weston: Tess Alphas, Celia Fleckner. Winchester: Sophie Olmsted. NEPSAC — Acton-Boxborough: Corinne Johnson, Kirsten Pfister, Peter Skaggs. Bromfield: Gabrielle Doben, Sarah Rowse. Lawrence Academy: Madeleine Kelly. Manchester Essex: Megan Jones, Alex Marshall. Marblehead: Sydney Andrews. Middlesex: Nina Harrison, Taylor McKenna, Sophie Vitzthum. Milton Academy: Amy Chappel. Nobles: Ashley Conley, Caley Dickinson, Tory Macdonald. Tabor: Michaela Braun, Alyssa Creager. Waltham: Cindy Lee. Wellesley: Katherine Carbonaro. Westford: Jessica Bishop, Natalie Bishop, Katie Stokes, Alexa Sullivan, Jessica Webb. North Shore — Andover: Kerry Christopher, Nicole Ericson, Sara Faigel, Julia Ganley, Jess Kearns. Masconomet: Nichol Brown. North Andover: Sarah Keith, Alyssa Zahoruiko.